Breast cancer is not just a challenge for those newly diagnosed – it is a challenge for all of us. Everyone knows a breast cancer survivor — they are our mothers, grandmothers, daughters, sisters, co-workers, and friends. 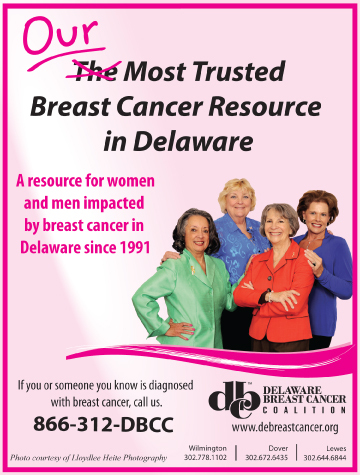 The Delaware Breast Cancer Coalition has been a trusted resource in the community for more than 20 years and remains the only organization in Delaware solely focused on breast cancer and breast health. We have programs that work to increase breast cancer awareness, promote the importance of early detection, provide access to mammography, and provide support and resources to men and women in our local community who are newly diagnosed or facing recurrence of breast cancer. DBCC does not receive any funds from national breast cancer organizations. We are funded by grants, community partnerships and individual donations. We are proud to be an organization that is supported by the local community that it serves. The money that we raise stays right here in the local community. If you or someone you know is diagnosed with breast cancer, please call us. We have programs that support those newly diagnosed with resources and one-on-one peer mentoring from someone who has already walked the journey. To learn more about DBCC, please visit www.debreastcancer.org or call toll-free 866-312-DBCC. Next Story → The Time Has Come.